Elizabeth Rose climbed her first major summit in 2015. 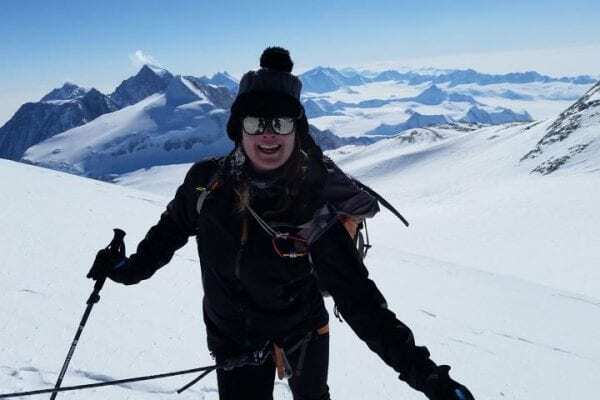 Now, less than three years later, the 26-year-old is poised to become the youngest Canadian to climb the Seven Summits – each of the tallest peak on every continent. For her final climb this November, Mount Kosciuszko in Austrialia, Elizabeth will be bringing a part of Canuck Place with her – a flag to display at the summit. She has a special connection to the hospice, her dad is former board chair, John Rose. Elizabeth made her first climb, Kilimanjaro, with her dad. Afterwards she trekked the Himalayas to Everest Base Camp with her mom, Susan. “The beauty and grandeur that surrounded me as we climbed inspired me to one day want to attempt to summit the majestic Everest,” she says. In 2016 she conquered Everest, with only three weeks notice, becoming the second youngest Canadian female to do so. While Elizabeth has a special place in her heart for each climb, her favourite was Mount Vinson in Antarctica. For Elizabeth living with an adventurous heart means being open to new experiences. You can support Liz’s upcoming climb for Canuck Place. Donate Today.